Our Kyowa Filter Units have been successfully installed by contractors working for Lancashire County Council. 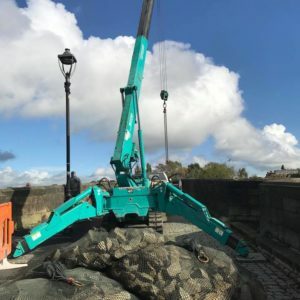 The filter units were utilised to provide scour protection on four piers of Penwortham Bridge in Preston. 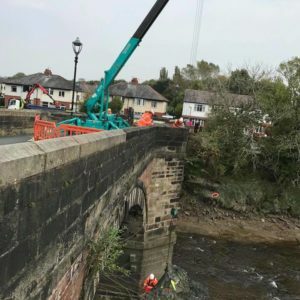 Penwortham Bridge is located on the River Ribble, the filter units are helping protect the structure from tidal waters as well as allowing the river environment to develop. 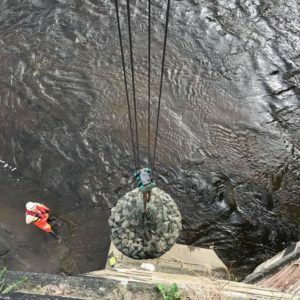 The Kyowa Filter Unit supplied by Ridgeway is simply a stone filled mesh net rock bag which can be utilised as a long-lasting solution for the protection of subsea foundations and cables. They are a recognised advanced solution to concrete mattress and rock dumps. The Filter Units are designed to encase the stone location, therefore are a long-term protection solution that omits future remedial works. They are made from 99% recycled polyester (PET) and available in 3 sizes 2, 4 and 8 tonne. 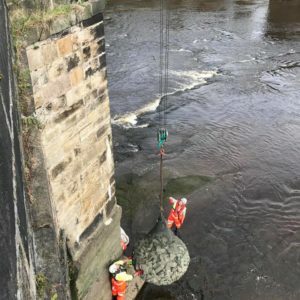 The Kyowa filter unit has a proven track record in UK & Irish waters as a simple and cost-effective solution for protecting structures in the marine environment. To find out more on our bespoke filter unit rock bag system please click here or alternativity call either Belfast +44 (0) 28 90454599 or Ashbourne +353 (0) 802 7173 or click the button below to send your enquiry via email.